What is Gamaïoun? A bird, born from the depths of the ages to survive the dawn of time. In Russian, his name is “Гамаюн”. Until now no one has seen it; But those who were able to hear him glimpsed it, and transmitted to us the essential attributes: two immense black wings, a tail set with feathers of fire, a face and a woman’s bust of a breathtaking beauty . This bird migrates between two worlds, that of the dead and that of the living, knows everything about men and creation. In Russia, he likes to nestle on the trees along the roads and, through his songs, unveil the future to all who pass by – vagabonds, exiles, adventurers, lost children, prowlers and onlookers. Alas, it is very difficult to hear because his song melts in the rustle of the wind; Especially, it does not reveal itself to everyone, but only to those who know how to hear a secret. Fortunately for the simple mortals, all the Russians who heard him sang it in turn: from Alexander Blok to Vladimir Vyssotski, passing by Sergei Essenine and Anna Akhmatova. Today, in France, it is in Natacha & Nuits de Princes that he became incarnate. Gamayun writes this Gaimun. What is it ? A magical voice and a pagan sensuality that transmits us, between a romance of Pushkin and an air of Fet, its own accents, incomparable. These are enchanting arrangements that sublime the union of all the strings: the domra and the double bass, the guitars and the balalaika. It is the Gypsy East and the Brazilian West, the Russian of the steppes and the French of the Balkans; It is the traditional and the jazz in ecstasy. Through fourteen titles, Gamayun sings the misery of exile and the splendor of travel, the weight of words and the comfort of silences, the gaiety of life and the lightness of death. What he predicts, Gamayun, is a dream – the melee in a bed, the West and the East finally united, the self and the me in solidarity, the whole earth around a table . He sings of love, he sings of freedom; He sings so justly. To us, passers-by as we are, to know to lend him an absolute ear. Starting from a repertoire of splendid Russian songs and romances, Natacha Fialkovsky, the daughter of a Russian immigrant, received the teaching from Natacha & Nuits de Princes from childhood, not losing sight of this initial emotional climate, While evolving step by step to adaptations or creations of songs written by the sweet Natacha, and arranged or composed by the talented guitarist and artistic director of the group, Olivier Cahours. From Russia to Hungary through the Balkans, this sextet, borne by the velvet voice of Natacha Fialkovsky, offers a fascinating journey through the gypsy musical diversity. An invitation under the sounds of balalaikas and jazz. Natacha is a beautiful artist with a warm and spellbinding voice inspired by Slavic melodies mixed with Brazilian accents of Latin rhythms accompanied by excellent musicians. Get drunk with these musical perfumes. A royal moment with the orchestra surrounding the fatal Natacha Fialkovsky. 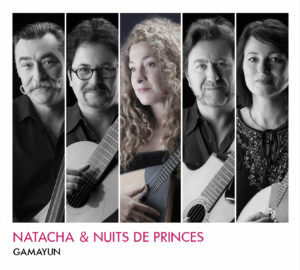 The magic of the Gypsy songs with the two guitars of Pascal Storch and Olivier Cahours.